This Gentle Body Scrub has been especially formulated to delicately remove skin impurities and refine skin s texture. 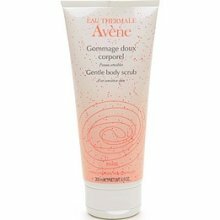 Its original formula, rich with Avene Thermal Spring Water, is endowed with soothing and anti-irritating properties. Its microbeads, selected for their high tolerance, provide an effective mechanical scrub. Their action is completed by an exfoliating agent which stimulates cell renewal. This synergy therfore promotes the gentle elimination of dead cells; refines the skin texture and leaves the skin clear and soft. Its creamy and gel-like texture prevents skin from dryness and provides a pleasant sensation of skin comfort.